Picking canistel fruits from a nearby tree was so much fun. This, thanks to a homemade fruit picker with net and pole that I fabricated using easily procured materials. One thing lacking in that DIY project though was the pole's length. At around 6 feet high, the apple fruit picker pole wasn't just enough to reach the upper branches of the canistel tree. What's sad is that at the higher branches, the fruits were bigger and riper. But lengthening the pole by adding pvc pipes (which are easily available) or replacing it with a longer pole may not be the obvious solution. This is because one other thing I noticed is that the fruit picker tool was a bit heavy for the pole. The fruit picker pole would sometimes bend when lowering the fruit picker tool to get the fruits from the net. Now if I extended the pole with the same pvc material, then definitely the longer pole would bend or bow even further. An option to get around this problem of the pole bending due to the weight is to use a lighter fruit picker tool. Thus, with a lightweight fruit picker tool, I may still use the old poles I was using. The opportunity to explore this option led me to search the internet for other possible lightweight designs. Here's one design I found that seems easy to make. It comes from a company called Fathom (rapid prototyping services, among others). 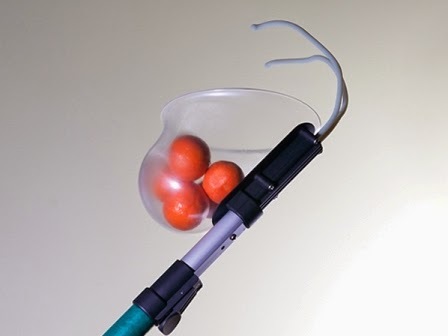 It basically has 2 prongs extending out from the top end of the fruit picker pole. 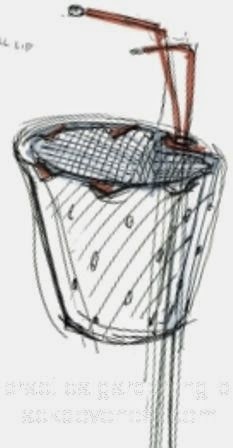 The fruit catching basket is positioned below the 2 prongs and its backside is attached to the fruit picker pole. Definitely, this design is able to pick apples, oranges, guavas, mangoes, peaches, pears, grapefruit and many more. From the same company came out this amazing prototype of the above design. The design shown in the above photos is actually quite easy to implement with some old household items and scrap materials. It is so cheap that the only store-bought items are small hardware materials like bolts, nuts and washers. The resulting homemade fruit harvesting tool or picker may not be as pretty as the one above, but it will be just as functional. It is cheap and lightweight and it's what I consider the best homemade fruit picking tool I've made. The disposable water bottle measures 1 foot high, 5" wide on all 4 sides. This plastic bottle will take the place of the fruit basket or net. Since it is transparent, it's easy to see if the fruits were indeed picked. This is the part of a paired-set that is screwed on the inside of the cabinet. This metal component will become the fruit picker stem. Its C-channel like body gives it the unique ability to cling and keep aligned with the pole along the pole's length. For this, I cut the tilt rod of a scrapped set of window blinds. The slats were recycled to make garden plant labels. The piece of steel rod will be formed to become the catch part of the fruit picker. It will have 2 prongs jutting out that will grasp and pull fruit from the tree branch. Shown below are are (from top): a 1-gallon drinking water jug, drawer guide rail, steel rod. Nut with 1/8" dia. hole: 10 pcs. Washer with 1/8" dia. hole: 4 pcs. The small hardware items above (bolt, nut and washers) will be used to fasten and hold together the pieces that will make up the fruit picking tool as well as the extendable poles. They also allow easy disassembling of the apple fruit picker if any adjustments are needed to be made. The 5 ft. and 6 ft. long pipes will be joined together to create a 11 foot long pole. The 2 ft. pipe serves as a coupling to join the pipes. Shown below are the 5 ft. pipe (orange), 2 ft. pipe (blue) and the 6 ft. pipe (red-brown).